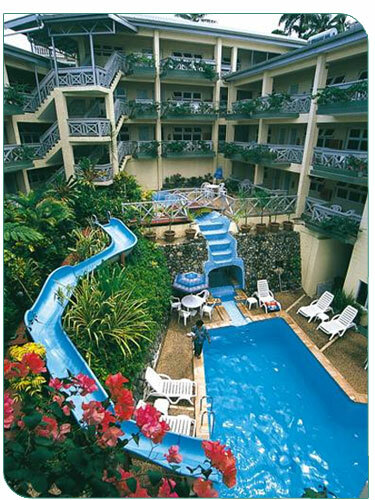 The Suva Motor Inn is centrally located within walking distance to the city and close to the Government Buildings. Accommodation is in modern two bedroom and studio units set in quiet, peaceful rainforest surroundings, all two bedroom units have full kitchen facilities. 46 Modern two bedrooms and studio units set in quiet peaceful, rain forest setting. Suitable for business, tourist or family stays. Very close to Government Buildings, central business district, sports amenities, restaurants, bars and entertainment area. Fax, typing facilities available. Hydro slide, swimming pool and Cave Spa. "Waterfall" Restaurant. Child Minding services available on request. Booking conditions:The rates are inclusive of government taxes. Children under 12 years of age can stay for free with parents/guardian using the existing bedding in room.